Raging Rotors: The FAA, FPV, and You Part 3: My Slice of the Pie « Big Squid RC – RC Car and Truck News, Reviews, Videos, and More! Sponsored pilots needing a commercial pilots liscense?! That’s just cruel…considering some of these pilots are kids, in what feasible world will some of them get the right paperwork? The AMA rules have suited hobby pilots for decades, what can the FAA do to step in outside of maintaining order in No-Fly Zones? 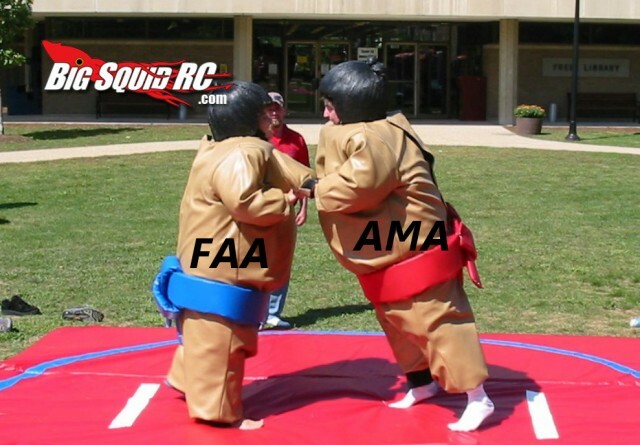 Rules Enforcement: So, outside of a strongly worded letter, what FAA police will be knocking at your door? None? I thought so, thanks budget deficit! Never fly without a spotter. Granted, a simple rule but FPV with goggles takes away peripheral vision, so a buddy is great to have especially at crowded flying fields. No extreme distances. I believe AMA requires that FPV flight be restricted to standard distances, so your spotter can still keep an eye on things. Personally, long distance FPV is only needed in military applications and show-boating, so don’t risk it. Know your technology. I see a lot on Facebook of people flying GPS enabled multirotors and having them fly away with their cameras/GoPros attached due to improper use or use of WiFi for video streaming, which runs on the same frequencies as GPS and Radio systems. Always read the directions/product data and be prepared for anything. I cannot wait, but this weekend is the IRCHA Jamboree in Muncie, IN! I will be in attendance on Friday and Saturday, and feel free to say hi if you’re there!! I will post pictures from the event next week and you can find more details Right Here. Did you also see the BigSquidRC Back to School Bash is August 30th? Details are on my earlier post.